NAIROBI, Kenya, May 11, 2012 (ENS) – For the first time, an electric vehicle is attempting an unassisted journey from Nairobi to Johannesburg, South Africa – a distance of 4,800 kilometers (2,982 miles). The driver is Xavier Chevrin, who left today after a sendoff news conference Thursday at the Nairobi headquarters of the United Nations Environment Programme. Peter Gilruth, director of UNEP’s Division of Early Warning and Assessment, flagged off the bright orange vehicle, which drove off with barely a hum from its silent electric motor. Chevrin is an English teacher on the French Ile de la Réunion with a history of long trips in electric cars. His 2010 trip from Shanghai to Paris was the longest journey ever made in an electric vehicle – a distance of 13,400 km (8,326 miles). Called Mission Africa, the journey is part of the UN International Year of Sustainable Energy for All, aims to demonstrate the reliability and energy efficiency of electric vehicles under extreme conditions and also highlight the lack of electricity in many communities in Africa. After a trek through Kenya, Tanzania, Zambia, Zimbabwe, Botswana and South Africa, Chevrin aims to finish in Johannesburg, an estimated 4,800 kilometers and 45 days later. According to UNEP’s soon-to-released flagship report on the state of the environment, the Global Environment Outlook 5, the current fossil-fuel based transport system accounts for a quarter of all greenhouse gas emissions. This figure is expected to rise to almost one third in the coming decades. Chevrin pointed out that the electric vehicle puts out zero emissions and is much cheaper to run than petrol-fueled cars. The Shangai-Paris trip cost less than US$200 dollars in electricity, compared to the $4,000 it would have cost to use diesel, Chevrin said. “We want to prove that electricity is an alternative energy source that can be used for transportation,” he said. As with the Shangai-Paris trip, Chevrin will trust in encounters with locals to recharge his batteries. He plans to use these random meetings to engage with ordinary Africans, inviting them on board the vehicle and showing that clean technology is a vital part of the world’s future energy sources. However, he will face the challenges of limited access to electricity and frequent power cuts in rural Africa. The car has no back-up generator, so should he run out of power he will be stranded, adding to the scale of the adventure. “Here in Africa is going to be the toughest so far because of the problems of power supply,” Chevrin said. 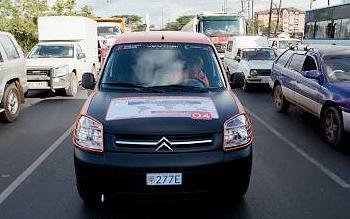 The vehicle is a Citroen Berlingo powered by Venturi, an enhanced version of cars used by the French postal service. While the vehicle in use by La Poste has one nickel sodium chloride battery, the vehicle Chevrin is driving down to Johannesburg has three. Recharging the batteries from scratch takes seven hours, plugged into a standard 240 volt socket. The Citroen Berlingo features a raised suspension to cope with bumpy roads. It can cover 500 km (300 miles) without recharge at a maximum speed of 110 Km/h (68 mph). 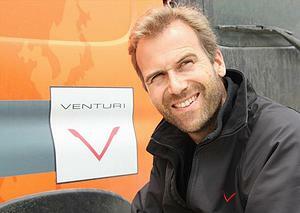 This journey is one of the Venturi Global Challenges, a series of technological and human challenges through which Venturi President Gildo Pastor Pallanca intends to demonstrate Venturi’s leadership in the field of electric propulsion. Each challenge takes place on a different continent in extreme conditions. 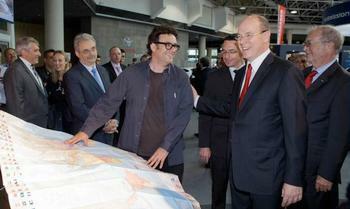 Mission Africa is supported by the Prince Albert II of Monaco Foundation. The foundation has a priority interest in developing countries and is focused on three main environmental issues: the fight against climate change, biodiversity conservation and sustainable management of water resources.